Real hope comes from looking unflinchingly at our current circumstances and then committing wholeheartedly to creative action. Never has that been more urgently needed than right now, with the climate crisis looming larger every day. 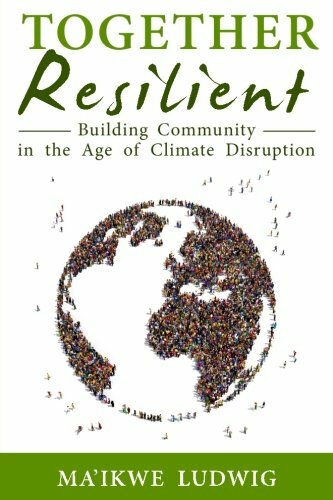 Together Resilient: Building Community in the Age of Climate Disruption, is a book that advocates for citizen-led, community-based action first and foremost: why wait for the government when you can take action today, with your neighbors? From small solutions to the full re-invention of the systems we find ourselves in, this book mixes anecdote with data-based research to bring you a wide range of options that all embody compassion, creativity, and cooperation. Together Resilient looks at intentional community as a model for a low carbon future. While looking realistically at the state of the world and the realities of climate disruption, it finds hope in examples of communities that already live high quality lives that the planet can sustain. It also looks at community as an essential element for surviving the coming (and already present) changes with more resilience and grace, and offers concrete examples of building community as a tool for reducing carbon emissions, outside the context of residential intentional communities.